Remember how healthcare costs were going to drop by $2,500 for every family? In 2016, employees paid $11,000 out-of-pocket … up $2,500 since 2012. 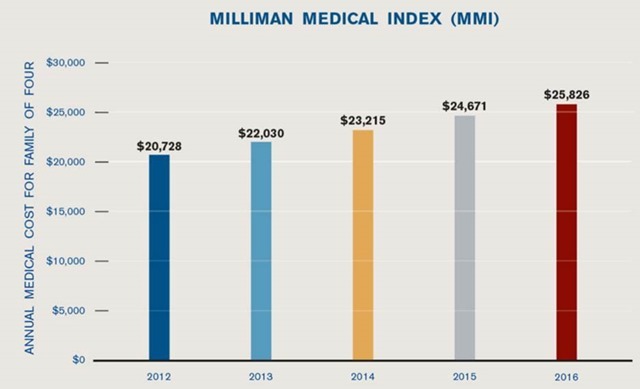 Milliman – a well-regarded actuarial consulting” firm – has published an annual recap of healthcare spending since 2001. The Milliman Medical Index tracks the total costs of providing health care to an average family of four covered by an employer-sponsored “preferred provider plan” … that’s about 155 million employees and their dependents. The total includes the health insurance premiums paid by both the employer and the employee, as well as the actual expenditures for health care paid by the insurance plan and out of pocket by the insured family. The big news: In 2016, the average healthcare costs for a family of 4 surpassed $25,000 for the first time … the $25,826 is triple the cost to provide health care for the same family in 2001 … and up about $5,000 since 2012. 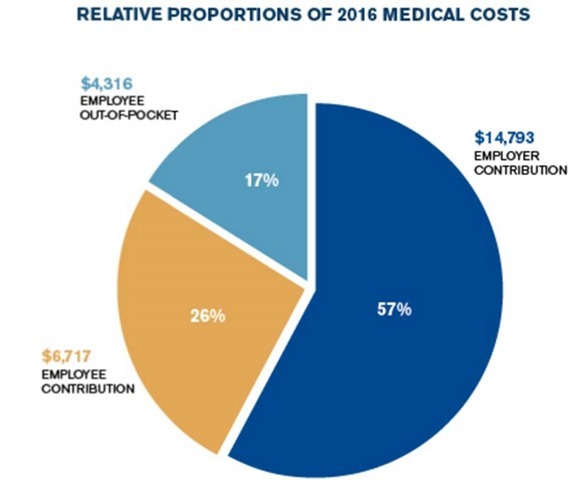 Milliman reports that employers now pay 57% of the total health costs …down from 61% in 2001. The average family of 4 now pays over $11,000 out-of-pocket each year … $6,717 in insurance premiums and $4,316 in deductibles, co-pays and uncovered expenses. 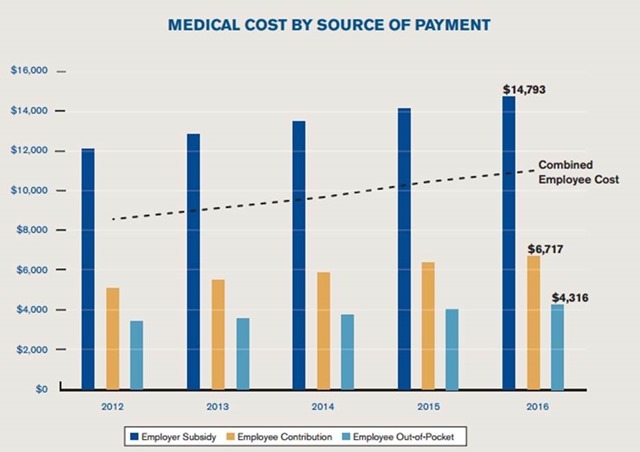 The “combined employee cost” – payroll deductions plus cash outlays – is up more than $2,500 since 2012. About a year ago, we posted the original: Remember how your healthcare costs were going to go down by $2,500 per family? Putting just two pieces together — the increased employee-paid part of premiums and the increased deductibles — means that an average family covered by an employer plan is now paying about $2,500 MORE out-of-pocket for healthcare than they did pre-ObamaCare … a $5,000 difference versus the promise of a $2,500 cut. This entry was posted on March 7, 2017 at 6:59 am and is filed under Health Care / Medical Insurance, ObamaCare. You can follow any responses to this entry through the RSS 2.0 feed. You can leave a response, or trackback from your own site.